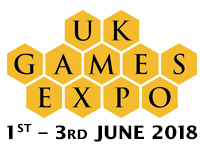 SJ Games is crossing the pond for a trip to UK Games Expo from June 1-3! We've sent a small expeditionary contingent of Retail and Press Liaison Ariel, and myself, to help teach the Munchkin Collectible Card Game at booth E5 (or the booth island thereabouts). We'll also be running drafts featuring the new expansion, The Desolation of Blarg! You can be one of the first to play with the newest expansion to the Munchkin CCG . . . plus, you'll most likely be opening a lot more rare cards than normal (you can read more about that here). Friday at 10 a.m. & 4 p.m.
Saturday at 10 a.m. & 4 p.m. This is my first trip overseas, and I'm looking forward to this amazing show. Come by, say hi, and play a game with us!